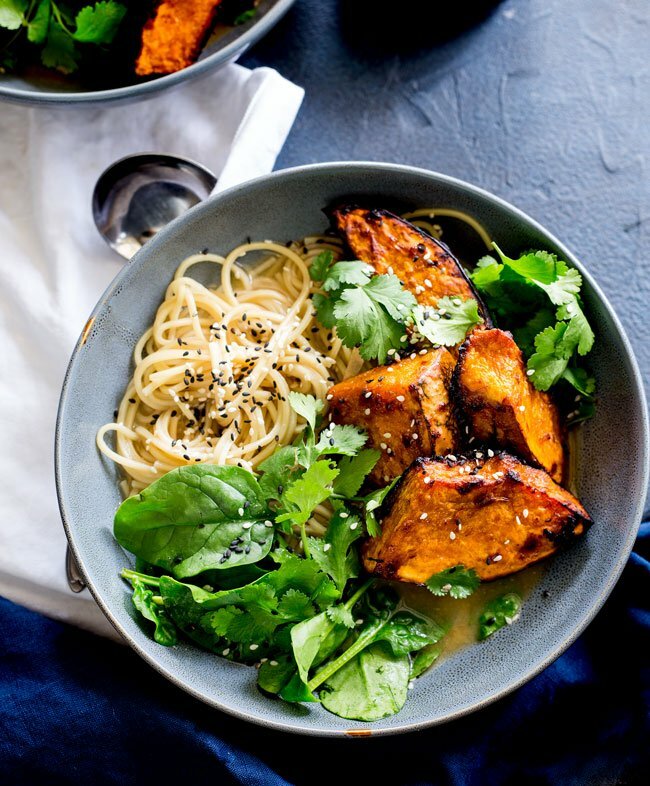 This Miso Ramen with Roast Pumpkin is a big bowl of slurpable noodle soup! It makes a great vegetarian or vegan dinner because it is so easy and super healthy. 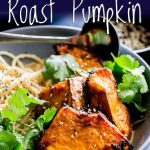 The roast pumpkin is the crowning glory, taking a simple bowl of ramen and making it something special. Perfect for those who don’t enjoy tofu but still want a hearty meat-free bowl of broth and noodles. I LOVE noodle soups! Maybe it comes from my pasta addiction??? But big bowls of noodles in a flavour packed broth are some of my favourite lunches. And pair that with roast veg, well it becomes heaven. It is no secret that i have a roasted vegetable addiction. 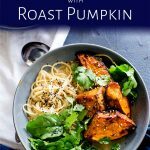 I have a whole post for roasted vegetable side dishes and there are several roast pumpkin recipes on the blog as well. Like my Maple Roasted Pumpkin salad or my Mexican Pumpkin with Black Rice. To make this dish easier (and in fact any roast pumpkin dish) don’t remove the skin from the pumpkin. The skin will soften and caramelise in the oven making it perfectly edible and delicious. Plus this ups the fibre content so it makes it healthier. Less work and healthier now that is a combo we can get on board with, right? 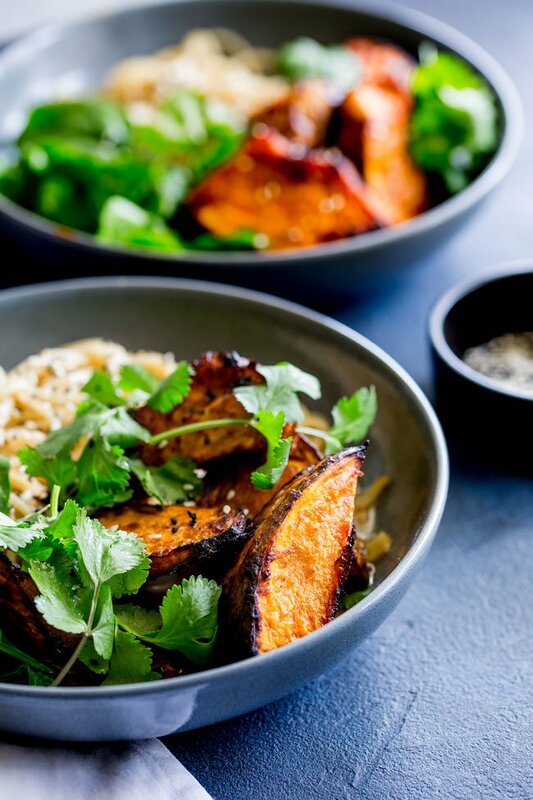 For this miso roasted pumpkin, the pumpkin is coated in a delicious umami rich mixture of miso, soy and brown sugar before being roasted to delicious crispy charred perfection. 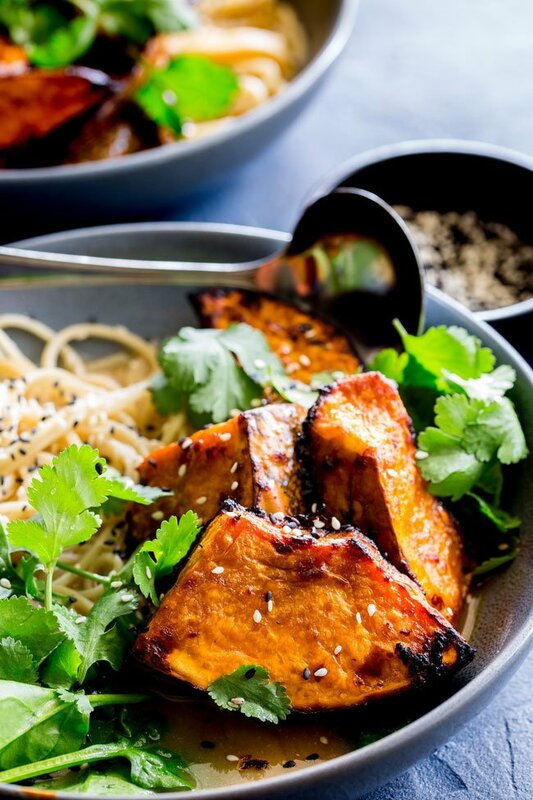 The brown sugar helps the pumpkin to char up and give you a fabulous savoury sweet smoky addition to your ramen. The oven is set at 400ºF/200ºC and the pumpkin is roasted for 30 minutes. After this time it will be tender and have a beautiful roasted colour. Some parts may look a little charred, don’t panic this is normal and adds to the flavor of the ramen. Which type of pumpkin should I use? The answer here is which ever you have or which ever looks good at the store. You can even use butternut squash. Really the magic happens with the sweet flesh and the roasted flavor so use what is good or what is on offer. 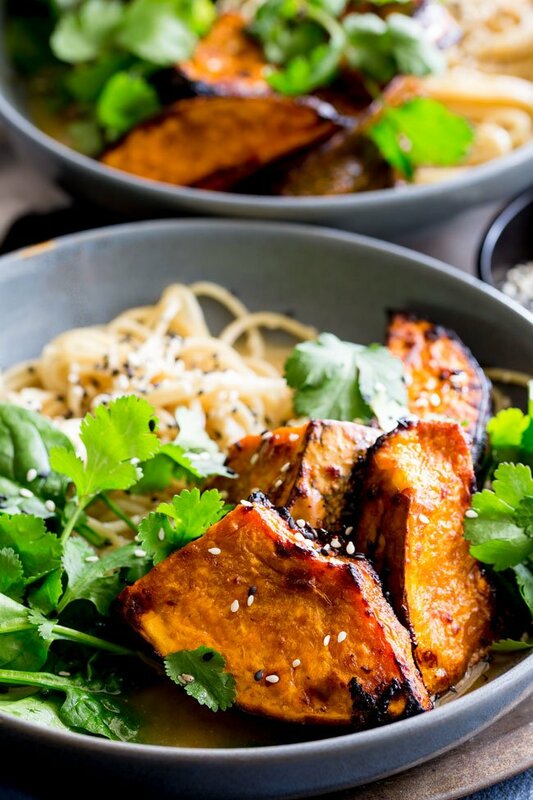 Is this pumpkin ramen vegan? This miso ramen with roast pumpkin is 100% vegan. And it is delicious as it is! Sometimes I may add shredded chicken, small shrimp or some slices of beef. For a vegetarian option a softly boiled egg is delicious. But when you have roast pumpkin like this you really don’t need any meat or egg. The pumpkin adds so much to the dish! Making this dish suitable for vegans. I’d go as far as to say that the roast pumpkin is the star of the show. Which miso should I use in miso broth? With so many different choices picking a miso can be confusing. The answer here is any miso paste will work, but the colour can affect how much you need to use. I have made this with red miso, white miso and yellow miso. The quantities in the recipe remain unchanged for white or yellow miso but with red miso you need less of it, so if using red miso add 2 tablespoons rather than 1/4 cup. Also before you serve your broth, give it a taste, you can add boiling water to dilute the taste if it has got too strong. Ideally you don’t boil miso broth. So cook the noodles in low sodium vegetable broth/stock and then whisk in the miso once the pan has been removed from the heat. To make it easier to whisk, divide the noodles between the serving bowls and then stir the miso through the broth and pour it over. This makes it easy to mix in the miso, plus it keeps the wonderful flavor and great health benefits of the miso. It also ensures the noodles don’t get too salty whilst they cook. I don’t know if it is just the brand of ramen I buy, but I find that my ramen noodles go squishy very easily if they are cooked with too much salt. I hope you love this roast pumpkin ramen. It is such a delicious and healthy dish! Why not pin this recipe for Miso Ramen with Roast Pumpkin. Pin it here. This Miso Ramen with Roast Pumpkin is a big bowl of slurpable noodle soup! It makes a great vegetarian or vegan dinner because it is so easy and super healthy. 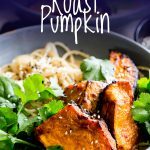 The roast pumpkin is the crowning glory, taking a simple bowl of ramen and making it something special. Perfect for those who don't enjoy tofu but still want a hearty meat-free bowl of broth and noodles. Whisk together the miso, soy sauce, brown sugar and olive oil. Pour the miso mixture over the pumpkin and stir well to coat. Lay the pumpkin out on a lined baking tray and roast for 30 minutes until tender and charred in places. Slice the ginger (no need to remove the skin), peel the garlic and cut the green onion into large chunks. Add in the noodles and cook over a low heat until tender. Remove from the pan from the heat and then stir the miso paste and soy sauce into your broth. 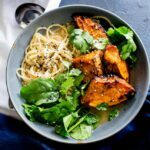 Divide the noodles between two bowls, add the roast pumpkin and spinach to each bowl. Pour over the miso soup (leaving the aromatics behind in the pan and garnish with toasted sesame seeds and plenty of fresh coriander. You can make this with red miso, white miso and yellow miso. However if using red miso add 2 tablespoons rather than 1/4 cup as it is stronger. I leave the skin on my pumpkin as I find it holds its shape better and I like the slightly chewy edge it brings to the dish. But peel it if you prefer. Depending on the size of your pan, when cooking the noodles you may have lost some stock due to evaporation. This could leave your broth too strong. Taste the broth before serving and add some boiling water if necessary. 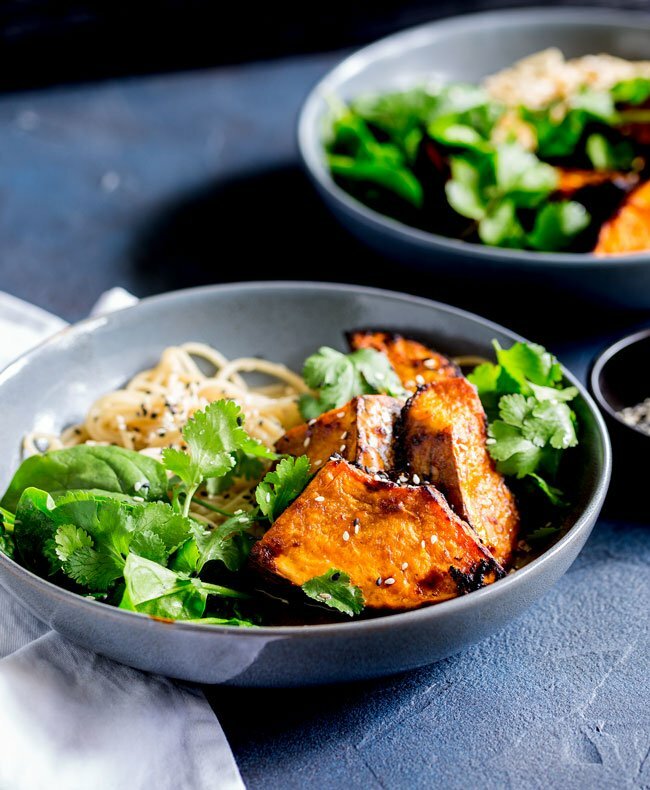 If you love food why not subscribe to my newsletter, I will drop you an email every now and then, just to say hi and send you a couple of recipes I think you might love, like this Miso Ramen with Roast Pumpkin. Ramen is my fave but never thought to add pumpkin, such a great add!! I had to come back to say that I made this and it is AMAZING!!! Isn’t roast pumpkin the best! This is such a fabulous blend of of flavors and also such a gorgeous dish! Thank you Wilhelmina, it is such a riot of fall colours isn’t it!